I went to London yesterday so that I could take part in the fans march. But I went early to do a little sightseeing as well. 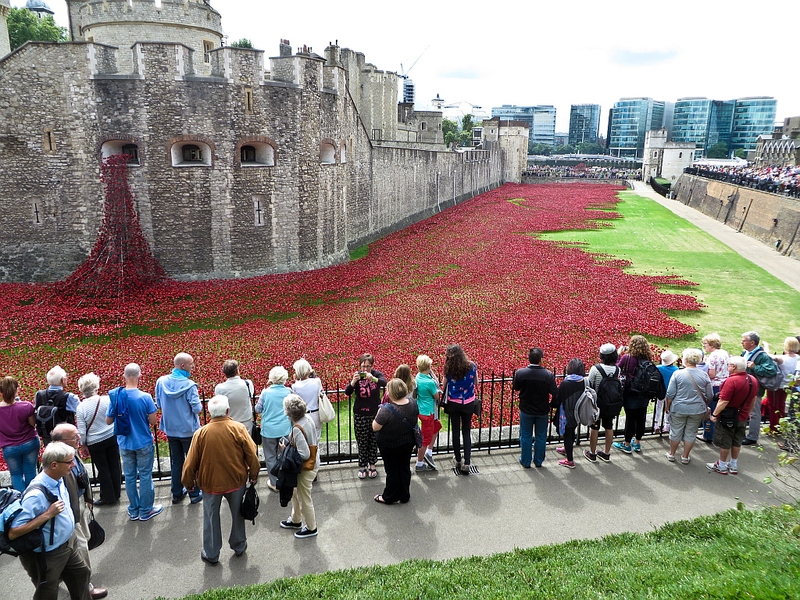 I walked over the Millennium Bridge and along the river to the Tower of London, to look at the poppies in the moat. By Armistice Day, November 11, there will be 888,246 ceramic poppies surrounding the Tower, one for each British and Colonial fatality during the First World War and a reminder of the colossal scale of the carnage. It’s an impressive and thought-provoking display. In the afternoon I went on the march organised by the Football Supporters Federation to protest at the way ordinary fans are being priced out of football. Premier League ticket prices have soared to ridiculous amounts and prices have risen in the lower tiers too. Match categorisation has made away games very expensive for supporters of the top clubs, because every away game they go to is a category A game. One of the aims of the FSF is to do away with the categorisation of matches for away supporters so that fans pay the cheapest price when they travel. Another aim is to get reduced prices for young people, from16 to 25 years old, an age group that has a low income. We gathered at Marble Arch and marched to the Premier League and Football League offices at Gloucester Place. A delegation went in to talk and the rest of us waited in a pub for them to come back and report to us. Not surprisingly, they didn’t come back with any agreement other than to continue with discussions between fans and league officials. So was it worth it? It got some media coverage for fans’ views on football; see links at end for examples. It showed that supporters of different clubs can co-operate: Man U, Spurs, Arsenal and Chelsea fans illustrated this by tying their banners together. It was an opportunity for fans from different clubs to talk to each other and I enjoyed that. One of the fans I talked with, Billy Grant, had been one of the fans representing Football League clubs on the delegation and had spoken to FL officials. He’s also known as BillytheBee and writes for Beesotted, the Brentford Supporters Network. Next week Brentford will be Birmingham City’s foe on the pitch but that doesn’t mean we can’t be friends the rest of the time. Football fans have more that unites them than divides them. This entry was posted in Birmingham City FC, Football and tagged Arsenal, BillytheBee, Birmingham City F.C., Brentford F C, Chelsea F C, Football, Manchester United F C, Tottenham Hotspur F C on August 15, 2014 by Puddleglum.